Want to support our advocacy work? Make a tax deductible donation to our Advocacy Fund today! Become a member of CPF to support our work year round! Join a network of more than 15,000 members and supporters who are invested in preserving California’s unique architectural and cultural heritage. Click here to learn more. On February 21, Senate President pro Tempore Toni G. Atkins introduced SB 451, a bill to create a state historic tax credit. The legislation builds on work we did in 2014, with the collaboration of the American Institute of Architects, California Council (AIACC), to promote tax credits. We are working again with the AIACC to pass SB 451 in 2019. The California Preservation Foundation is a sponsor of this crucial legislation. We need your support to secure passage of SB 451. We expect this bill to cost CPF between $40,000 – $60,000 in direct and indirect costs to get through the legislature. Join us in this fight by making a donation to the Advocacy Fund today. Your donation will be matched dollar for dollar (up to $50,000) and will help us move this important bill forward. On Wednesday, April 3rd, the Senate Governance and Finance Committee voted 5 to 0 to move SB 451 forward! The next step on the path to the governor’s desk is the Appropriations committee, where we expect it to be heard shortly (the hearing date is still to be announced). 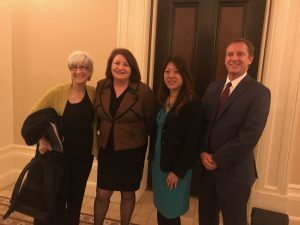 Image Description: Cindy Heitzman with Senate President pro Tem Toni Atkins, State Treasurer Fiona Ma, and Mark Christian from AIA California at the Capitol in Sacramento, after a successful committee hearing. On Wednesday, April 3rd, the Senate Governance and Finance Committee will hold a hearing on the bill. Speaking in support of the bill are Senate Pro Tem Toni Atkins, State Treasurer Fiona Ma, CPF Executive Director Cindy Heitzman, and Mark Christian, AIA CA. If enacted, SB 451 will encourage economic development of properties on or eligible for the State or National Register of Historic Places through a 20% investment tax credit, placing California alongside 35 other states who have adopted a state historic tax credit program. Click here for more information about SB 451. We encourage our members to send letters of support to your representatives. We need to show our representatives in Sacramento that historic tax credits have broad support. Click here to locate the contact information for your representative, and use the text below to begin writing your letter of support. [Name of Your Organization is/I am] writing in support of SB 451, a bill that will authorize a 20 percent state income tax credit for the rehabilitation of certified historic structures. Preserving the integrity of local historic structures serves not only as an important acknowledgement to our city’s rich past, but as a way for entire communities to benefit from the economic development of such properties. The tax credits provided by SB 451 will incentivize the restoration of neglected and underused buildings in communities across California. Restoring these buildings will create local construction industry jobs and increase local revenues by adding property value as well as provide for restoration of buildings that include affordable housing, transit-oriented development and improve the safety of our historic buildings. State Historic Tax Credits make historic rehabilitation financially feasible, leverage significant private investment, and are a consistently strong return on state investment. We look forward to joining the 35 other states that have successful state historic tax credit programs and seek your support. Thank you for your commitment to preserving California’s heritage through your support of SB 451. Click here to read more about CPF’s advocacy work.